This 6.8m2 ‘glass box’ extension allows the new kitchen and dining spaces of this Category B listed early Victorian townhouse to spill out into its small, south facing walled garden. Our aim was to develop a minimal, highly glazed and scrupulously detailed addition that very lightly brushes against the historic fabric of the house. Despite being small, the effect that the extension has in bringing the spaces together, both internal and external, is large. In developing the original 2 storey service outshot, we re-introduced, in contemporary form, the ‘back’ stairs that would have linked the staff areas with the upper floors of the house. 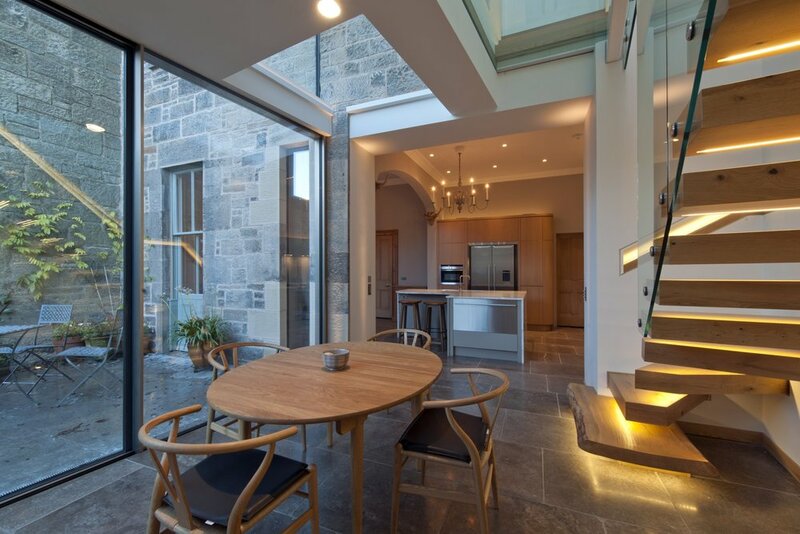 The new cantilevered stair, below a frameless 2.7 x 1.5m triple glazed rooflight, links the kitchen to the master bedroom via a glass bridge which also gives access to a small terrace where the final rays of evening sunshine can be enjoyed when the garden falls into shadow. The glass bridge maximises light reaching the dining space below. The entirely frameless glazing is only interrupted by a near coplanar band of stainless steel at the ceiling zone and a sophisticated, Swiss made, 3m tall by 1.8m wide triple glazed sliding leaf to give access to the garden. The whole structure is supported on a single, slender, stainless steel circular column in-bound of the glass. Designing the landscape treatment also allowed the inside to integrate with the outside. The new limestone flagstones continue beyond the threshold to a morning terrace and the extension terminates at the reflecting pool with its stepping stone access to the remainder of the garden.